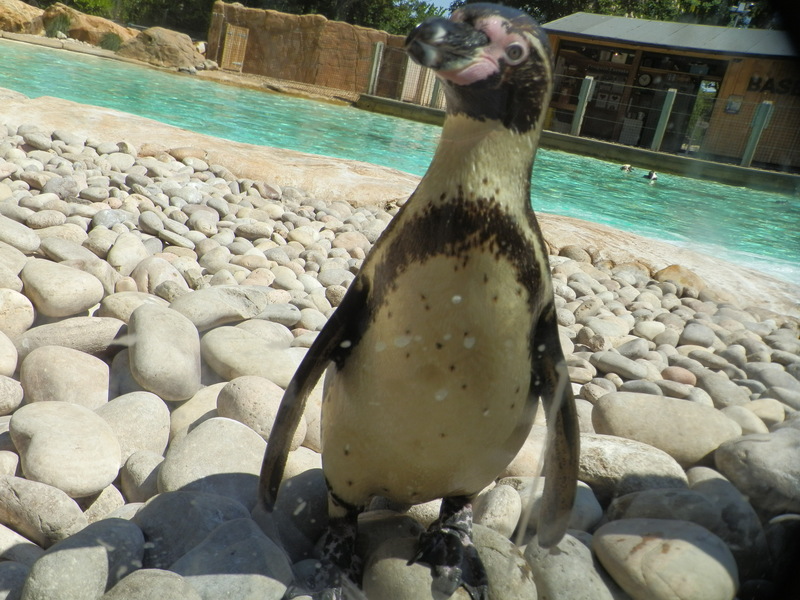 At 13,000 square feet the London Zoo’s Penguin Beach pool is the largest of its kind in England and home to rockhopper and Humboldt penguins. With daily live feedings you’ll be able to see this cute penguin colony splashing in the water from above or below with underwater viewing. Amongst the waddling penguins on their large rocky shore are a couple of herons, probably waiting to steal some fish. With over 160,000 species of butterflies and moths in the world, here at the London Zoo you’ll encounter a fraction of them at Butterfly Paradise. 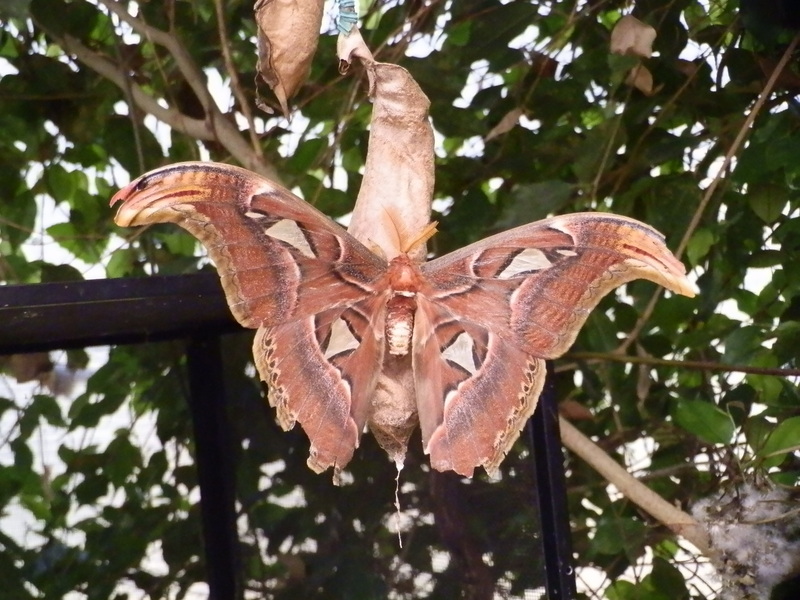 Butterfly Paradise houses species from Africa, South East Asia, as well as Central and South America with a variety of lush plants that provide nectar and breeding areas. All around you are a variety of butterflies and moths of various shapes, sizes and colorations, fluttering around and even landing on you. On our visit we even saw the before, caterpillar, and after of the stunning owl butterfly with its pseudo-eyes looking at you. There’s also a pupae breeding room so you can see the development of new butterflies. One of my favourite things here is the mimosa plant, or ‘touch-me-not-plant’, this perennial herb folds its leaves onto itself when you touch it. It is one of the coolest, most interesting plants I’ve ever seen. An amazing building at the London Zoo for many reasons is the Biodiversity Underpinning Global Survival building, otherwise known as B.U.G.S. This environmentally friendly building generates its heat from visitors and animals body heat and aims to educate the public on biodiversity. Housing more than 140 species you’ll see everything from spiders to poison dart frogs. Can you imagine, 98% of all known animal life are invertebrates, so here at B.U.G.S. it’s no surprise that the majority of species on display are invertebrates. The historic Reptile House that was built in 1883 was refurbished and is now the Blackburn Pavilion. The Blackburn Pavilion is a walk through aviary full of beautiful birds and home to over 50 species. In this recreation of rainforest and cloud forest environments there are tropical plants, pools and an indoor waterfall. 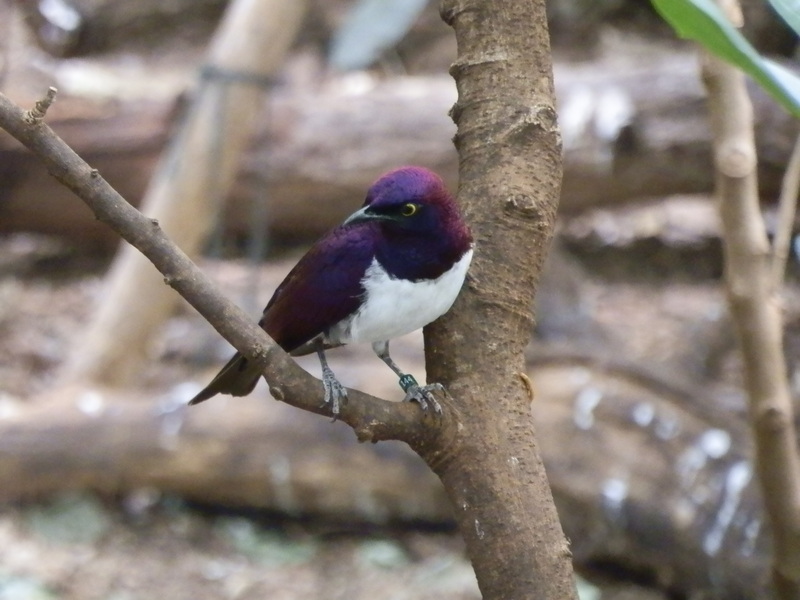 Here you’ll see birds like the striking violet-backed starling with its iridescent purple head and back with contrasting white breast, the splendid sunbird that also has iridescent feathers of purple and green that can hover like a hummingbird, love birds and the Socorro dove that is extinct in the wild. After a stroll through Animal Adventure, an exhibit built with young hearts in mind with tunnels to pop up in the meerkat enclosure or watch coatis play and porcupines and aardvarks slumber, you’ll find yourself in the Outback. With its rich desert atmosphere on the hot, sunny May day we visited it was like being transported to Australia’s Outback as we watched wallabies and emus sun bathe. Through an underpass you’ll arrive at London Zoo’s Into Africa exhibit. Here a platform view brings you face to face with giraffes. The original giraffe house was built in 1837 but had to be rebuilt after WWII when it sustained serious damage due to bombing and now boasts the tallest doors in the zoo at 6.5 metres (21 feet) high. 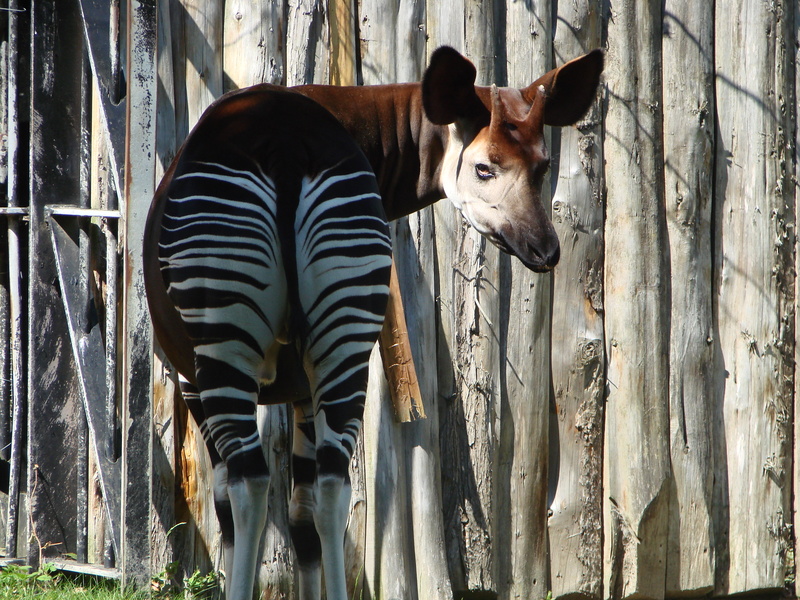 After a stroll past zebras you’ll be standing in front of what looks like a hybrid of zebra and giraffe and happens to be one of my most favourite animals, the okapi. This shy forest-dweller was once called the African unicorn, and believe me seeing them in person is an enchanting experience. Also found here are warthogs and hunting dogs, as well as a great view of Regent’s Canal and the next exhibit, Snowdon Aviary. After crossing the scenic Regent’s Canal you’re faced with a massive structure, the Snowdon Aviary. 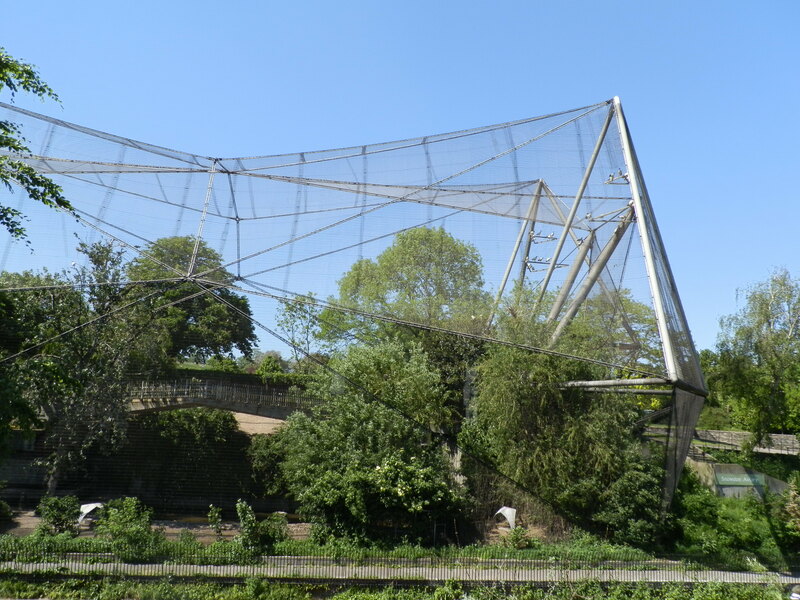 Built from 1962-64, it was one of the first walk-through aviaries in the world. With a variety of habitats from ponds to dense foliage and tall trees, taking a stroll along the path you’ll see birds like the ruby-red scarlet ibis perched in the trees to bright white cattle egrets flying overhead and flamboyant peacocks strutting their stuff to ducks splashing in the water. 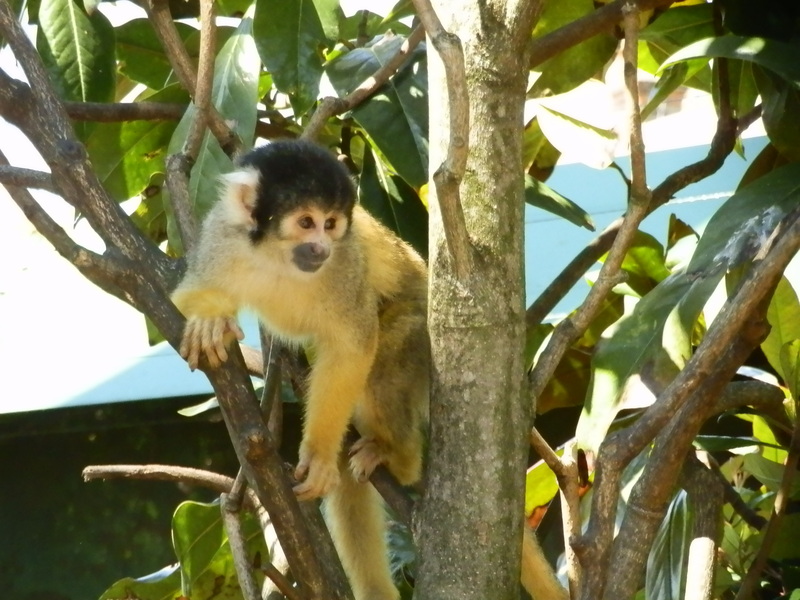 One of my most favourite exhibits of any zoos I’ve visited is the Clore Rainforest Lookout. This exhibit recreates the South American rainforest and provides forest floor to canopy habitats for a fantastic multi-species, no barrier experience. 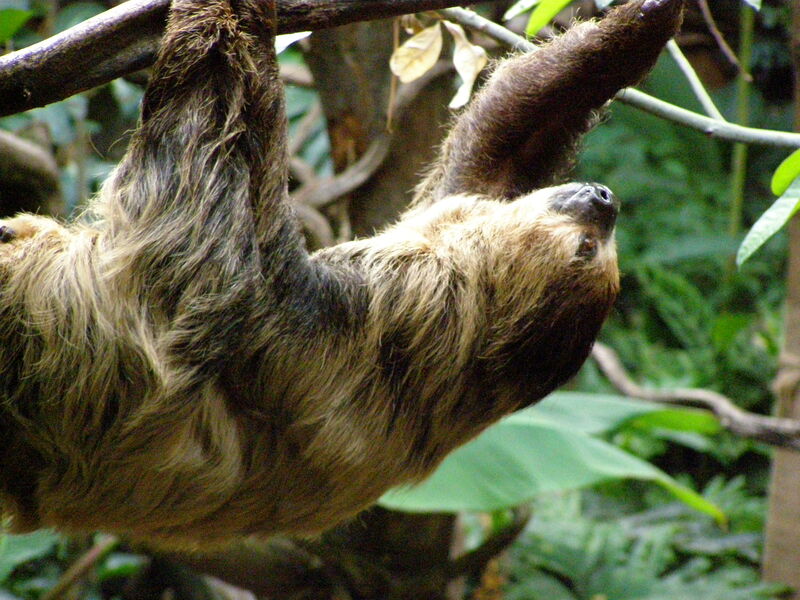 Whether your walking around its forest floor seeing the trumpeter bird strutting about or agoutis foraging, or you’re at canopy level watching emperor and golden-headed lion tamarins groom each other or sloths literally hanging out, you’ll be truly smitten with the multitude of animal life and thrilled by this transporting exhibit. Also in this pavilion is the Night Life exhibit that takes you from day to the darkness of night while you open your eyes wide on the lives of nocturnal animals like the slender loris with their chameleon like movements, Rodrigues fruit bats and Malagasy giant jumping rats. The Zoological Society of London’s Zoo is a great place to experience unique animals in natural habitats, learn more about animals in their Animals In Action show and spend the day enjoying a piece of history. I recommend the London Zoo to anyone visiting London and I look forward to visiting again and again.